As information and communications technologies have converged, your enterprise's telecom environment, and its management, have grown more complex. You struggle to get the best deal possible while juggling multiple service providers to supply the optimum mix of wireless and wireline services. And once your services are in place, you still must ensure they are effectively deployed and their expenses efficiently managed. Selecting a telecom management platform is no small undertaking. It must be robust enough to manage a complex inventory and expense environment yet intuitive with a high level of usability to ensure enterprise-wide adoption. 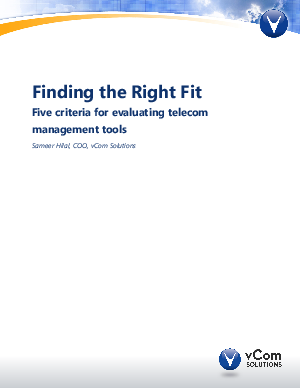 This report identifies five criteria you must consider when evaluating tools for managing your telecom environment.